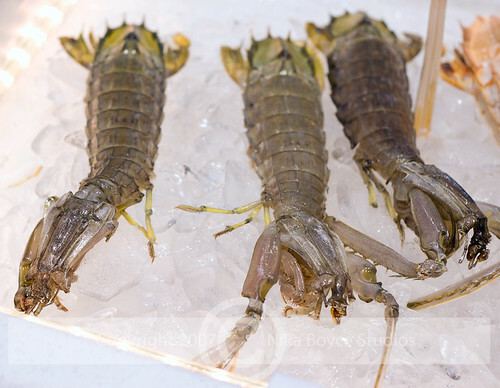 You are browsing the Blog for International Boston Seafood Show. If you can believe it, I have even more photos from the [tag]IBSS[/tag]. This set today is from a [tag]cooking[/tag] [tag]demonstration[/tag] at the cooking theater that day. The [tag]Phillips[/tag] Seafood Company had some of their [tag]corporate chef[/tag]s cooking up some of their products. My feet were screaming for a rest and there was simply no better place to take a break, watch some entertaining cooking, and eat some delicious [tag]seafood[/tag], brought right to you. You can’t beat that! I did not catch the names of the various chefs so this is not really hard-boiled journalism (as if it ever is!). Just enjoy it for the food. 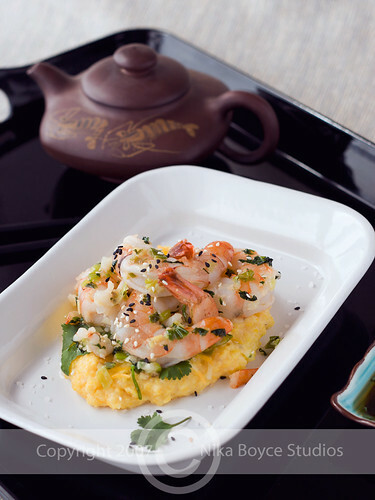 The chef here is actually cooking a different dish but I thought I would share anyways. 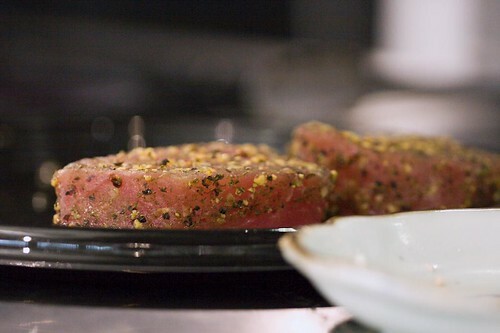 The [tag]tuna[/tag] [tag]steak[/tag]s, seasoned and ready for the pan. 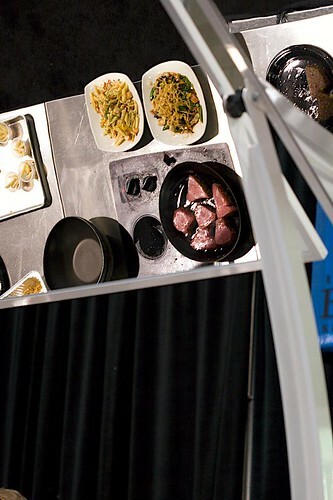 Here is a shot of the steaks from the mirror above the cooktop. 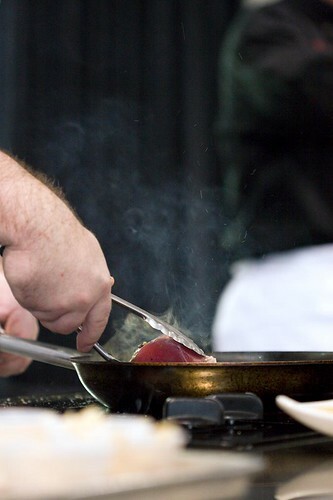 Tuna steaks hitting the hot [tag]saute[/tag] [tag]pan[/tag], hot oil and tuna goodness sparkling up into the air. Here the chefs are portioning out samples for the crowd. 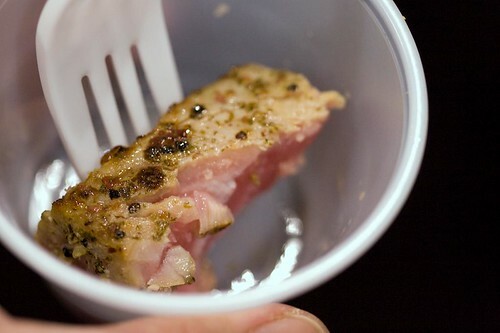 Succulent delicious barely cooked tuna. Fantastic. See another view at the top of this page. All the pics here are mine. I am flying without photoshop right now so I am not yet up to speed on watermarking the images. All photos – all rights reserved. When my daughter and I went to the [tag]2007 International Boston Seafood Show[/tag] this last Monday, we got to meet [tag]Kathy Maister[/tag] and Stephen from [tag]startcooking.com[/tag] and [tag]stephencooks.com[/tag] respectively. Wow, what a couple of awesome foodies and food bloggers. We were chatting (after various mishaps in trying to find one another in that huge place) and getting to know each other while surrounded by a huge array of awesome smelling [tag]food[/tag], calling our names. We did not get to talk long enough by any measure. We will be planning more [tag]New England[/tag] [tag]food blogger[/tag] get togethers for a bit later this year. If you are in this orbit drop a note with an email so I can keep you in the loop. I live in central MA so it takes me 1.5 hours to get in but I consider [tag]Boston[/tag] part of my neighborhood. 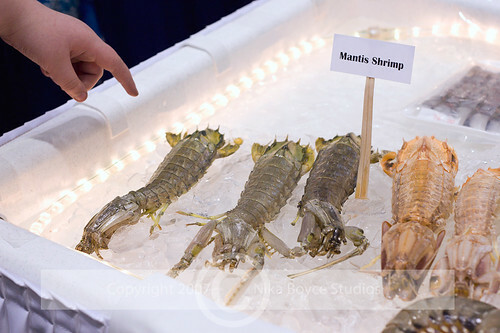 This last Monday when I attended the 2007 International Boston Seafood Show, I got to sample quite a few products. Let me assure you, I had to pace myself because there were so many tempting foods. One product that I sampled toward the end of the day was the [tag]frozen[/tag] [tag]sushi[/tag] by [tag]Polar Seas[/tag] (a PDF of their products), a collaborative product of [tag]Brooklyn[/tag], NY, based [tag]True World foods[/tag] and [tag]Kyokuyo Co[/tag]. in [tag]Japan[/tag]. I tried it with some trepidation because I have had some fantastically bad chilled (frozen?) sushi at grocery stores and I am still scarred. 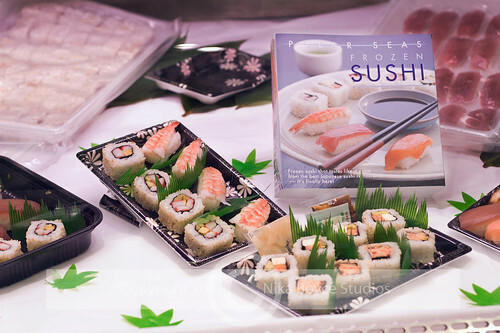 I have never bought sushi frozen in a box for that reason. But I had to give it a try, mostly because I felt like I would be able to tell whether it was at least edible. Most of the other samples I had that day were fried, lots of masking. 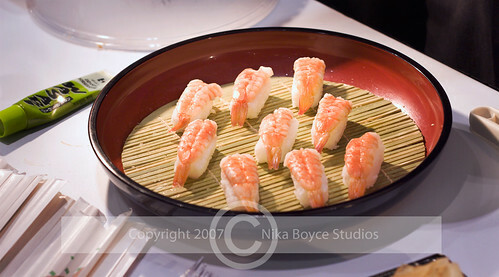 Good sushi is based on fresh fish but perhaps more importantly, in terms of where it can go horribly wrong, good sushi MUST have GOOD RICE, period. 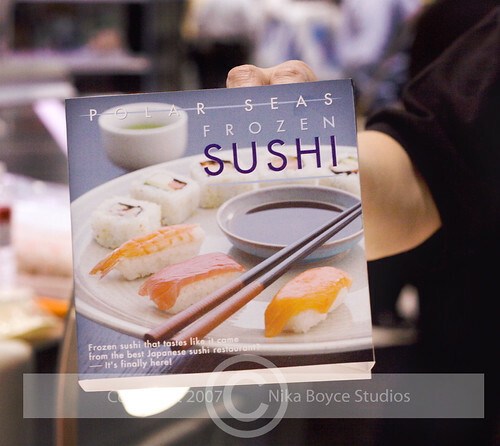 Frozen or chilled sushi [tag]rice[/tag] can be vile and nauseating: mushy, watery, and revolting on the tongue. Can you tell I feel pretty strongly about the sushi rice? Just a bit. 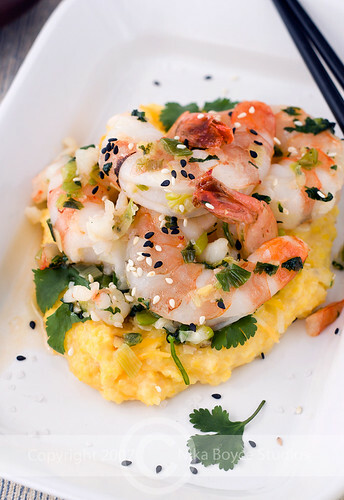 The [tag]shrimp[/tag] didn’t taste like eggs like a lot of frozen shrimp does, thank goodness. It tasted like a natural non-preserved shrimp. 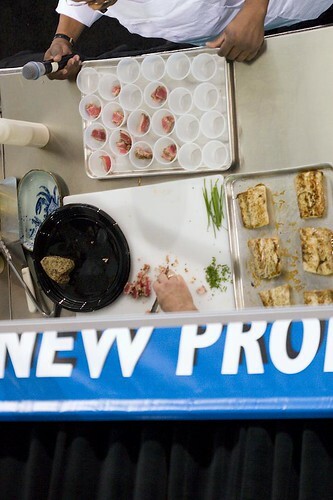 The samples were flying off the trays (the crowd was a couple people deep around the display) so when we asked for [tag]Tuna[/tag] [tag]Nigiri[/tag] they said there was none thawed but some that was frozen. They gave us a frozen piece and we walked away with it on a plate. It thawed rapidly and before we expected it, we were enjoying a delicious tuna nigiri. 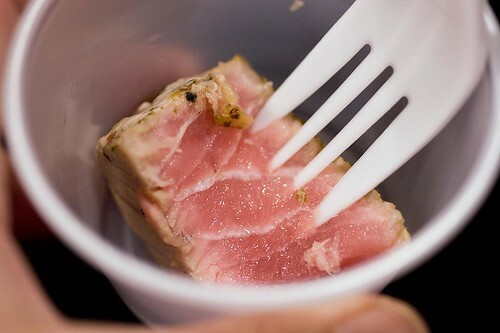 Additionally, the tuna tasted fresher than what we have had in sushi restaurants. Makes you wonder about the possibility of using this frozen product in an ice-packed lunch box. Put the pieces in frozen, put in your ice packs, and then allow them to thaw right before eating. I would have to test that concept out a bit before recommending it. The [tag]spicy[/tag] tuna roll was flavorful and quite satisfying. We also tried several [tag]unagi nigiri[/tag] (BBQed eel) but do not have photos to share. 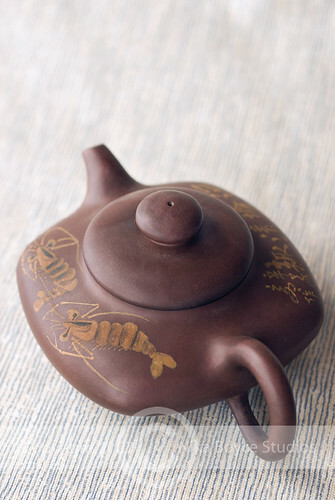 We could not get enough of it, so delish. Oh, the rice was spot on. It wasn’t gummy, it was tasty, it was good sushi rice, and it was a pleasant surprise.